Look what was spotted in the wild! We've talked a bit in the past about why it's important for Munchkin, Zombie Dice, and our other games to appear in big retail stores: big stores means a bigger audience, and a bigger audience leads to more new stuff from us. 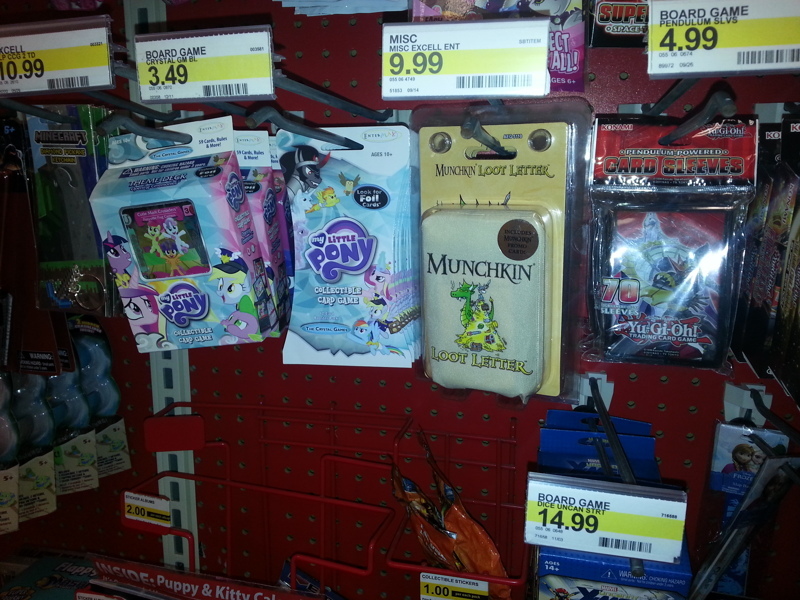 But what's important about Munchkin Loot Letter appearing in Target is that this is a licensed game. This is a game AEG made, using the Munchkin license. This is, of course, good for them in the same way that our games appearing in such stores is good for us. But it's also good for us because it starts to show people that Munchkin is a lot bigger than just the card game. This is the kind of thing that could lead to others picking up the license, and that leads to all kinds of other cool Munchkin games right alongside Loot Letter, Munchkin Panic, Munchkin Adventure Time, and the bevy of third-party Munchkin stuff coming out in the next year or two. It's really exciting to see this new phase of Munchkin's existence taking off like this!